A reader wrote: "I would like to know the recipe for Kreppel - Jam Doughnuts". So here it is! 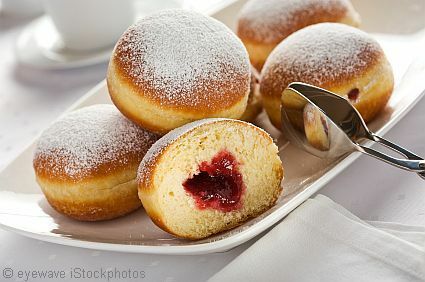 Jam donuts have many names, depending on the region in Germany. 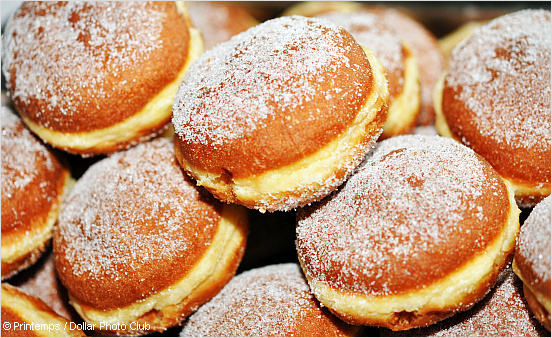 Krapfen, Kreppel, Berliner and Pfankuchen are common names. * mix the jam until smooth, fill into a piping bag or decorating pen with a long tip, pipe the jam into the Kreppel. If you use cups instead of a scale, please check this page for flour facts and gram to cup conversion. Preparing Kreppel is not difficult, but it needs patience to let the dough rise twice. So don't hurry. I've searched far and wide and am not sure where to find vanilla essence or a substitute. Where can I find some or it's equivalent? I am so homesick for a few Berliners. I've mastered the Brötchen, Knodel, and a few others. Now I need to make these. No Anne, I don't think the result will be the same when you bake them. Can they be baked instead of fried? i used only 3 cups of flower 4 1/2 are just to much. My great grandma Mary made a doughy, breadlike treat that I recall fondly from my early childhood, but have never seen again. Today, wondering if perhaps she was mispronouncing zeppole, I began an internet search, which finally led me to this recipe. I recall her kreppels being more triangular, but now I know how to start! Thank you!! A packet of dried yeast weighs 7g and is sufficient for 500g flour. If you like to use fresh yeast you'd need 21g for 500g flour, which is half a packet of fresh yeast. Can anyone please tell me how much a packet of yeast weighs? I have a large container of dried yeast and need to know how much to weigh out. Your help would be most appreciated! Thanks for the great tip, Pat. When I made mine for the first time I rolled out the dough to about 2 inches and took a glass as a Kreppel cutter and put them on a floured sheet for a third rise and then I put them in 18oC cooking oil in my dutch oven and closed the lid for about 1 min and turned them and another minute... they came out perfect and tasted amazing. I did everything you said and mine did not turn out like that at all. The dough was missing somthing.. I wish I could make them like that. i really like the idea if the krepple. is the smatest person in the world. i would like to thank you . you have helped me alot and i give you praise for that. thank you and i hope you post more. Return to Dessert Recipes .